I’m enjoying a leisurely Friday morning. I’ve had two excellent cups of coffee already, and a slice of toasted homemade bread. I’ve made a quick round of some of my favorite blog reads on Google Reader. I’ve read some chapters from the Bible online at Blue Letter Bible, and listened to my husband talk about Galatians 3, which he is reading this morning. All of this I’ve done, but one USUAL happening for a weekday morning that I’ve not done is get ready for work. Our school district remains closed due to flooding. It’s not raining just now, so the flooded rivers and streams must be receding, but I guess some road cleanup remains to be done before school reopens. 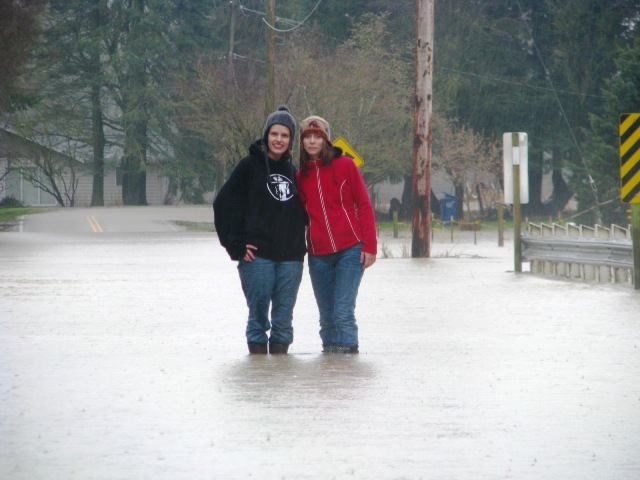 Two of my daughters standing in a ‘puddle’. It gets much deeper, as a neighbor in waders proved later on.